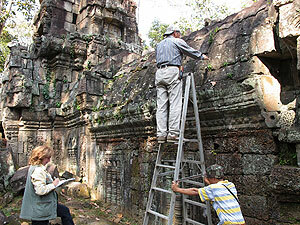 From the end of November to the beginning of December, we conducted research and investigation on local cultural properties in Cambodia and Thailand. At the Ta Nei site in the Cambodian Angkor Site group, we conducted a survey on the relationship between the various plants, which grow thickly on the stones at the site, especially on the lichen and moss species and the environment, together with Professor Julia Caneva at Roma Tre University in Italy. In Thailand, in order to survey the effect of a chamber on site conservation, we observed the Buddha leg stone and relief carved in the laterite of Prachin Buri in the east and the Great Buddha of Wat Sri Chum at the Sukhothai ruins. We conducted a survey on the lacquer used for the Buddha statues in Ayuthea and Bangkok. In addition, at the Fine Arts Department, we had discussions with Thailand, our partner in joint research, on how to proceed with future research. This included discussions in regard to the presence of the Department Director.